What a power packed pedigree with this bred cow. Her dam measures 81" and her sire Cowboy Tuff Chex is the longest horned bull EVER with 102.25"" T2T. This combination, gives us Cowgirl Star. 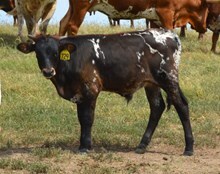 She is exposed to Pistol Packer for a 2019 calf.